Description: Chic and alluring, this tulle fit-and-flare features shimmering lace appliqués and bead detailing over Inessa jersey. 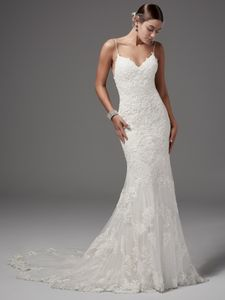 Gorgeous crisscross strap details accent the gown‘s open back, completing the shoulder strap V-neckline. Finished with zipper closure.